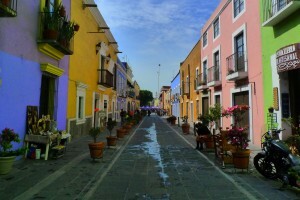 Puebla is a modern, safe, mid-size city with rich culture, history and beauty. It’s full-time springlike climate, attracts people year round as they desire to escape both hot and cold climates. And since English is not readily spoken in Puebla as in many tourist centers of Mexico, Puebla is the perfect place for a complete cultural and Spanish immersion. Puebla was officially founded April 16, 1531, under the name of Puebla de Los Angeles (Puebla of the Angels) after according to the legend, angels laid rope across the empty land to indicate where the city’s principle streets and buildings should go. The best way to get to know the city is by starting with its historic center, where in seven square kilometers you’ll find more than 2000 religious and civil buildings full of history, tradition and legends. Fun Fact: Contrary to many beliefs, Cinco de Mayo is not a national holiday. Puebla is the only state in Mexico that celebrates. On Cinco de Mayo the people of Puebla (known as poblanos) celebrate the famous battle of 5 de Mayo, 1862 in which the Mexican army under the command of General Ignacio Zaragoza defeated the French on Puebla soil stalling the French invasion and inevitably changing Mexico’s outcome. Soon after, the city’s name was changed to the currently official name, “Puebla de Zaragoza” in honor of the person most responsible for this historic event. For more information on the city of Puebla, try these non-LIVIT-affiliated web sites for tourists. The content and/or site addresses may change without notice. We are not responsible for their content.